Is it just me, or does it feel like I take stock a lot? I guess it's a useful exercise to keep looking at where I'm going and where I've been. It does get frustrating, though, when I see goals carried over from list to list, from year to year, with little or no progress on them. I'm sure I'm not the only person who does it. "Lose weight" and its corollaries ("get fit," "start exercising," "eat healthier food," etc.) are a perennial for me, as I'm sure they are for others. Financial resolutions/goals/what-have-you are ever-popular, too. Jim Devitt posted a goal development checklist at Indies Unlimited about a week ago (between his own manic cookie baking and manic gift-wrapping, I guess) that puts a slightly different spin on the project. I finally had time to catch my breath the other day and write down my answers. Number 4 on his list -- three things you need to stop doing in 2014 -- seemed to be an eye-opener for many of those who commented on his post. It's not that it's difficult to list the things you need to quit doing; that's the easy part. The hard part is to actually quit doing them. One of my three things in this category is to quit reading books on marketing without actually following the advice. It's so easy to let those pearls of wisdom just slide past my eyes and then keep doing the same dumb things I've been doing all along. If I'm going to take the time to read the books, I ought to be taking notes, at least. We'll see how that goes. Tune in here again this time next year. When it comes to writing and publication, my goals for 2014 look very similar to my 2013 goals. I want to finish Undertow and get it ready for publication around the spring equinox, and then I want to write Scorched Earth and get that out the door before the summer solstice. And then I need to figure out what to do in the back half of the year. 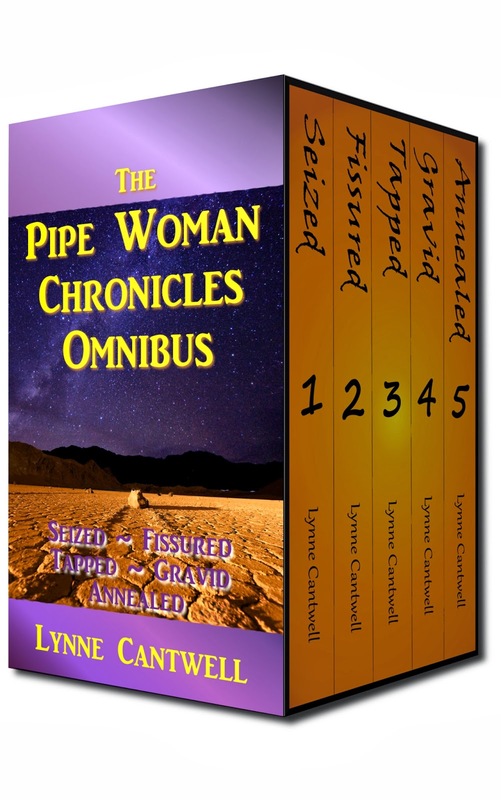 I'm planning one more series in the Pipe Woman Chronicles universe -- another trilogy, probably, with a grown-up Sage as the main character -- although I don't know whether I'll be ready to start it this year. I may write another stand-alone novel instead. I've been thinking of trying my hand at magic realism. Or I may try Susanna Lakin's strategy and write a book in a hot-selling genre. I don't know about you, but pulling down $3,000 a month from one book sounds like decent money to me. I would definitely like to tweak my yearly writing-and-publication schedule so that I'm not trying to sell a new release in the same month that I'm writing the first draft of another book. Last month was just too stressful for me. If it means I have to skip NaNoWriMo from here on out, so be it. I can do Camp NaNo in April instead. Or make my own NoWriMo in whatever month I choose, which is what I've been doing for one book a year anyway. Overall, I'm still on the seven-year retirement plan, and publishing three novels a year seems to be a reasonable pace for me. If I keep that up, and assuming the story ideas keep flowing as they have so far, I could have another 18 novels out there by the time I turn 62. That would bring me to 26 published novels -- a decent body of work. And just think of all the time I'll have on my hands after I retire to write more! These moments of New Year blogginess were brought to you, as a public service, by Lynne Cantwell. It's been a bit hectic around here lately. Besides all the usual holiday prep, my editor is visiting for the weekend. Among other things, we're kicking around ideas for projects for the coming year. One of the projects under discussion is an editing service. We're using, as a springboard for the discussion, David Antrobus's recent terrific series of Indies Unlimited posts about hiring an editor and about editorial pricing. If you're looking for an editor (and if you have a book to publish, you had damn well better be) or if you're thinking of hanging out your shingle as an editor, I highly recommend that you check them out. In my own book news, I'm scheduled for an interview at Lucy Pireel's blog on Tuesday. 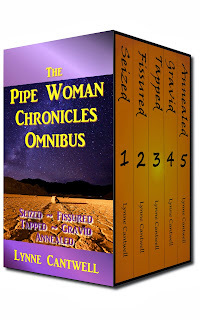 And on Wednesday, in honor of the first anniversary of the start of the events in Seized, the Pipe Woman Chronicles Omnibus goes on a special Kindle Countdown sale at Amazon.com and Amazon.co.uk. The regular price for the five-book set on Amazon.com is $8.99, but on Wednesday, the price goes down to $3.99. Friends and neighbors, that's less than a dollar a book. The price will gradually rise over the course of the following week, until on Christmas Eve, it'll be back to $8.99. The UK pricing is similar -- starting at 99 pence on Wednesday and going up to the regular price of £5.61 on Christmas Eve. It's going to be an amazing, dirt-cheap deal for somebody. Please let your friends know! Thanks! One comment I often get from other writers is, "How do you write your books so fast?" To which I usually do sort of an awkward shuffle (which looks really awkward online, let me tell you) and say something lame like, "I write short books." Which is true, to a point. But mainly, my technique is to draft what I've taken to calling a rough outline-ish thing. I talked about it briefly in my pre-NaNoWriMo post this year. Basically, it's a paragraph per chapter, more or less, about what I plan to accomplish in that chapter. It doesn't include every twist or nuance, mainly because I don't always know what form each twist or nuance will take until I sit down and write the scene. But it does give me a rough road map to follow. And it's hugely useful for battling writer's block; when I sit down for a writing session, I can look back at the last page or so that I wrote the day before, glance over my outline-ish thing, and know immediately where I need to start writing today. Stephen King says in On Writing that he thinks plotting is clumsy and anathema to creation. Overall, we tend to agree. Some books — often fast-paced thrillers — suffer from a mechanical style of progression, where everything is really convenient because it has to be lest the structure crumbles. But we also think, for us at least, that having some idea of where the story will eventually go is absolutely required to avoid a meandering narrative. Stories should be tight and focused, even if they’re quiet pieces without serious action. Beats will help that. We don’t think Stephen King would object to the idea of beats (not that we need to impress him) because they’re not rigid. You think you’re going here, but if you end up there? Ain’t no thang. We write our beats with the idea that we’re predicting what will happen rather than requiring it to. Sometimes we guess right, and sometimes we guess wrong. If you guess wrong but still feel that something must happen, this is where the “pantsing” part takes over, and you deviate from beats on the fly. Here’s the rule: You’re allowed to manipulate the environment, but not the character. In other words, if you need for your character to be in New Orleans in order to set up the next chapter, you can't have your character do something out of, well, character, to get there. For example, your broke but moral-high-ground protagonist can't rob a bank to get the money for a plane ticket. Anyway, if your writing is bogging down, you might try writing some story beats and see whether they help you get your story moving again. These moments of bloggy beats are brought to you, as a public service, by Lynne Cantwell. I thought I'd start decorating for the holidays a little early this year, since November was such a rough month. But hey, the good news is that the first draft of Undertow is done! Whoo hoo! I finished the book with a day to spare for winning NaNoWriMo. The first draft clocks in at about 51,000 words, which is somewhat shorter than Crosswind. But I expect to revise the first chapter, and I will probably add another scene or two at the end. The Crosswind kickoff was a great success, and now I get to start flogging the book in earnest. ("Flogging" is a good thing in this context, in case you were wondering.) Tomorrow, I'll be hosting the MasterKoda Cyber Monday Bash on Facebook from 7:00pm until 8:00pm Eastern time, and I've got some cool prizes lined up. I ran down to the National Museum of the American Indian this afternoon to pick up some things from their gift shop, and I just might be giving away one or two of them tomorrow. On Friday, the Cabin Goddess has me back for a Fourth-Wall Friday. On December 11th, I'll be at Girl Who Reads for her Writer Wednesday feature. And on December 17th, Lucy Pireel will be asking me some pointed questions on her blog. Who knows? We might even talk about the book. And if that's not enough, I'll be doing a blog tour in January, after the holidays. When it came to holiday prep, I used to be the most irritatingly organized person in the world. This was before marriage and children, mind you. But I used to be that annoying person who began her Christmas shopping in September when the holiday catalogs started hitting the mailbox. I'd have everybody's gifts ordered by mid-October, so that all the shipments would arrive at my house by mid-November. That would give me time to wrap them and have them shipped out right after Thanksgiving. Then I'd spend the first week of December writing my Christmas cards. I always had those in the mail before my birthday (which, if you're playing along, is December 7th). I was then able to enjoy my birthday, and the rest of the holiday season, guilt-free and stress-free. You can stop hating me now. I am not that woman anymore. I mean, the cards are out. But that's only because our family tradition now is to sit down after Thanksgiving dinner and have a grand signing/stuffing/sealing/stickering session. We do it then because that's the only time I can be assured that everybody will be gathered in the same place long enough. And of course, I'm one of those insufferable people who sends a holiday letter inside the card. Which, if you're playing along, means I had to pull together the cards and the address labels and design, write, and print the annual letter at the same time as I was writing a 50,000-word novel in 30 days. You want to know why I love December? Because NaNoWriMo is over! We will not even begin to discuss the state of my holiday shopping list. Suffice it to say that I thought I could get away with getting everybody on the list a gift card -- until I saw my daughters' wish lists. And then I remembered that I really ought to get stuff for the knitting/quilting group (I am ashamed to admit that I skipped last December's meeting because I hadn't bought them anything), and that I had fully intended to knit a little something for each of the women in my book club. And, oh yeah, I need to bake cookies. Yule is Saturday, December 21st, this year. I've got just under three weeks to pull it all together. But hey, that ought to be a piece of cake, right? If I can write a novel in a month, I can do anything! These moments of rah-rah blogginess are brought to you, as a public service, by Lynne Cantwell.